I’ll tell you a secret: I’ve actually been wearing the latest pattern on Instagram (and indeed in my blog profile picture) for months and nobody guessed! 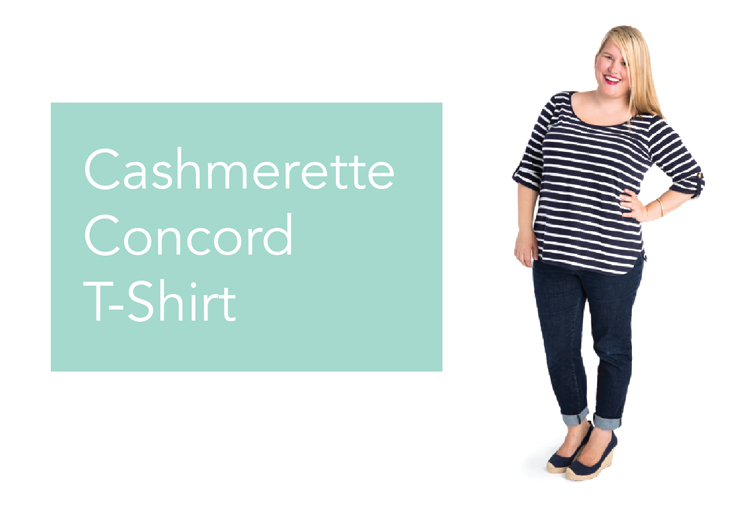 But now I can let you in on the fun, and introduce the latest Cashmerette Pattern, the Concord T-Shirt. Sewing a T-Shirt that fits curves has been on my to-do list forever, and the joy of having a sewing pattern company is that I was able to make it a reality. 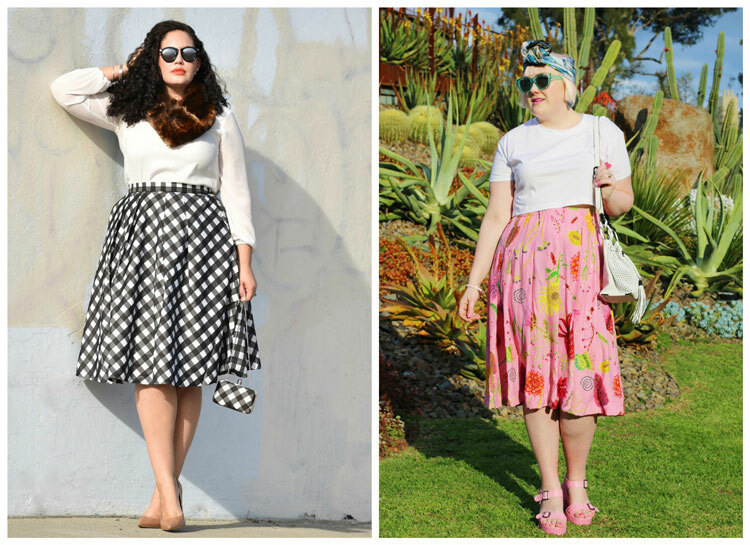 There’s a reason I have so many Concords in my wardrobe – the pattern is super easy and quick to sew up, infinitely adaptable, really comfortable, and (cliched, but true) you can dress it up or down as the whim takes you. 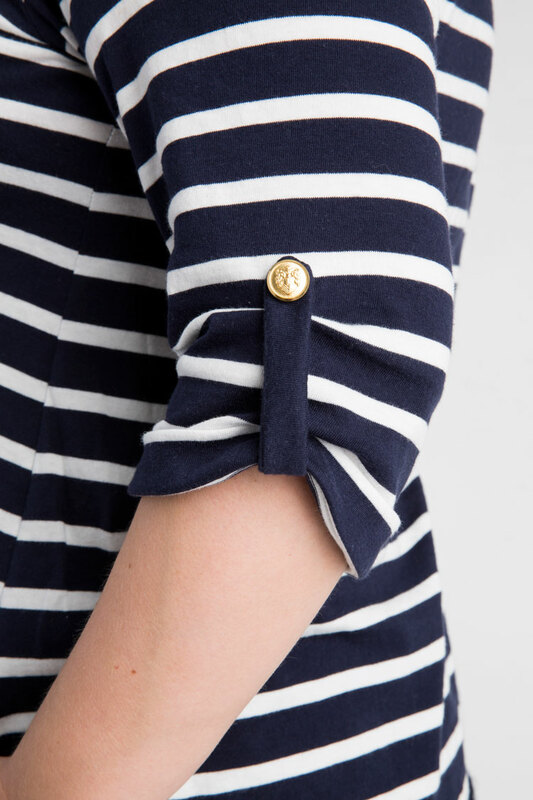 And sleeve tabs so you can do fun ruched sleeves with a button fastening! My fave. 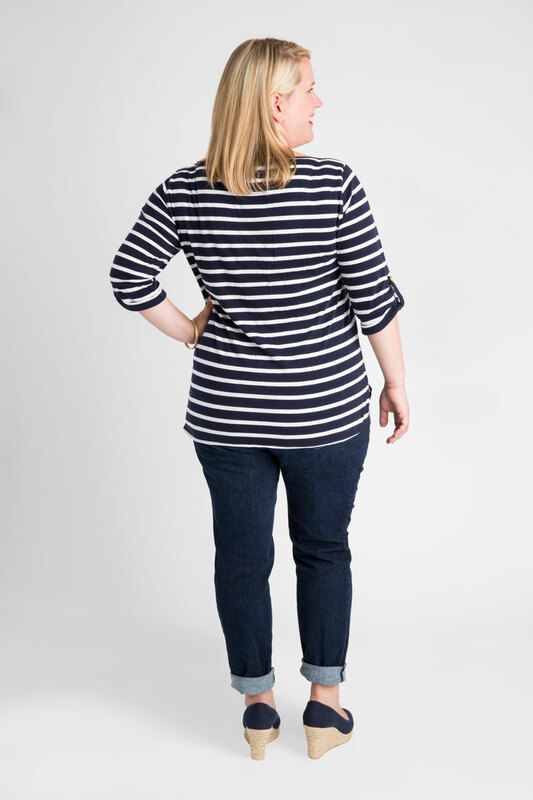 The Concord T-Shirt suits knits with at least 20% stretch – I have a stable of Breton striped versions (naturally), a rainbow of solids, and a few really awesome hacked ones, which I’ll share with you soon. 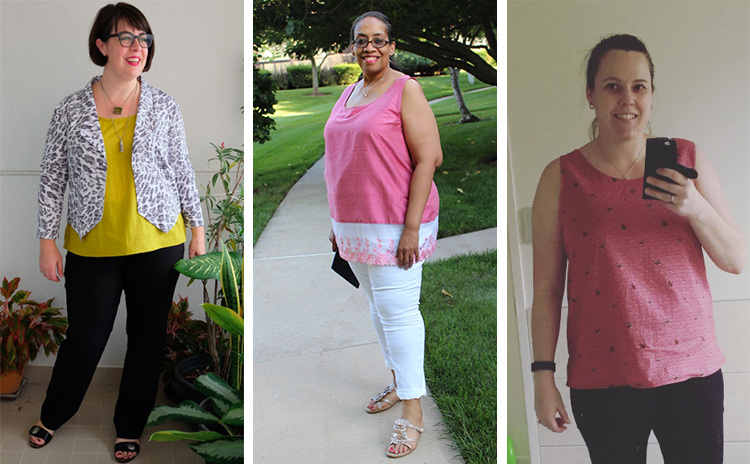 The pattern is perfect for beginners, or folks wanting to start out with knits – you’ll learn how to install a great round or V neck neckband, how to hem knits and tips on sewing with them – and you don’t need a serger, a sewing machine will do just fine. 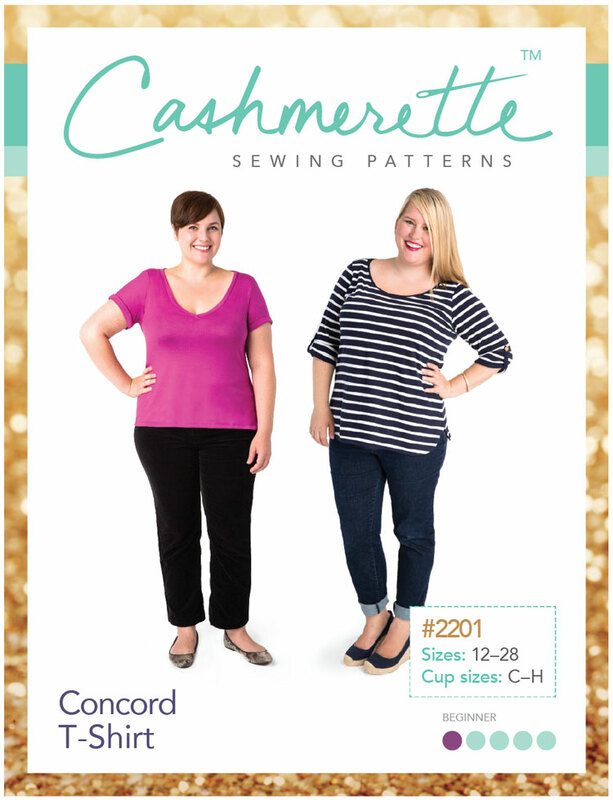 The Concord T-Shirt comes in the usual Cashmerette Patterns sizing of 12 – 28, and cup sizes C – H, and it’s available as a lovingly printed paper pattern here, or as an instant-gratification PDF here. As finding high-quality jersey knits can be a real pain in the neck – and particularly the search for *perfect* width stripes – I also sourced some really awesome designer jersey and ponte for Concord T-Shirt kits. If you purchase a kit, you’ll receive a copy of the printed pattern, together with fantastic fabric that works really well for the pattern. I’ve been wearing all my kit Concords on the regular! 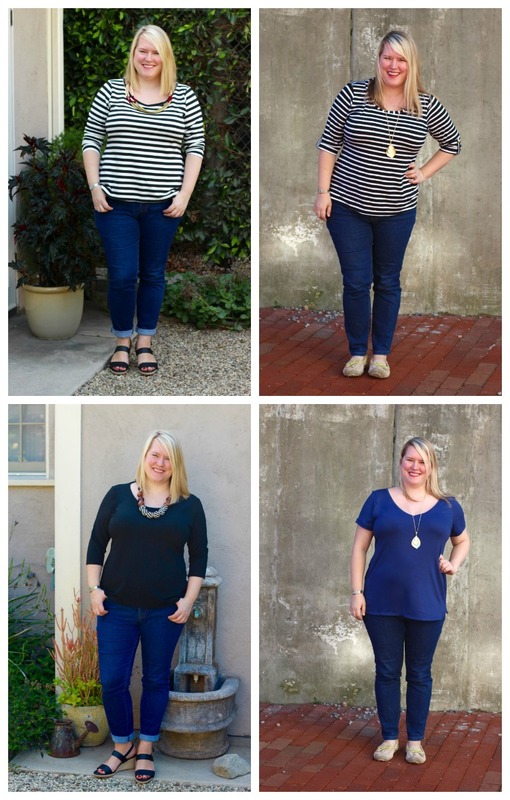 Clockwise from top left:black & white stripe ponte kit; black & white stripe rayon jersey kit; navy viscose jersey kit; black rayon jersey kit. 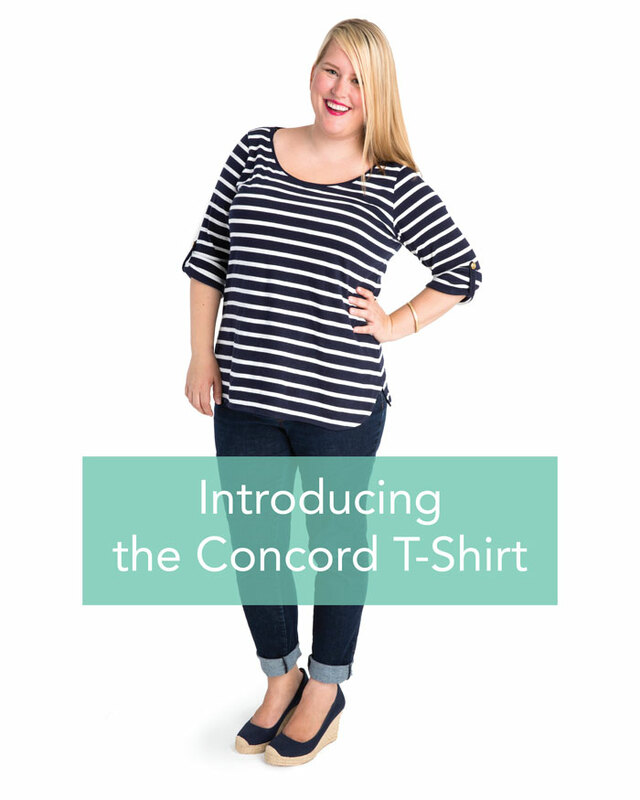 Already decided you want a Concord T-Shirt? Then just click one of the buttons below and it will take you directly to checkout. I really hope you love the new pattern – it’s simple but thoughtfully designed, and hopefully could become a Tried’N’True pattern of your wardrobe. Let me know what you think – and what you’d like to see next! And of course, tag your Concord T-Shirts on social media with #ConcordTShirt so we can all revel in the glory of your amazing tops. Yay! I’m excited to try this pattern out. I definitely think this will become a staple in my sewing life, and probably for my mom as well. She fell in love with the tunic length version with the button tabs. YAY! I already ordered mine. Can’t wait to whip a few up!. love the sleeve tab detail. Congrats, Jenny! Its a great basic and i need to make some more! Perfect. I ordered it right off the bat. I was waiting for a t-shirt that was made for a D cup without the darting! 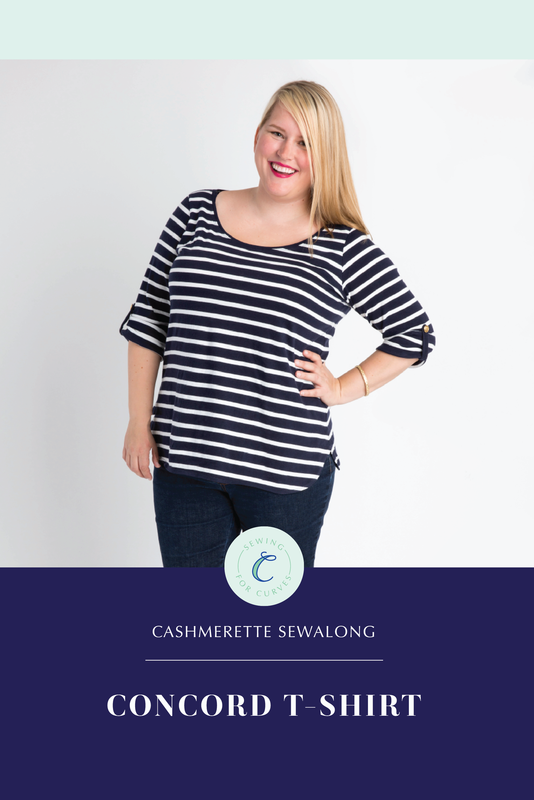 This will be my first Cashmerette pattern. Its basic, and yet will fill a hole for me. Love it. This might be a simple pattern worth having at last. But I have a question, is the striped one you are wearing the one with the scooped neck? Hi Dalia! yes, I’m wearing the scoop neck, long curved hem (I’m 5’6″ for reference), mid sleeves and tabs. Just ordered! I had a quick look at the pdf and I like what I see, nice shaping! I love your pattern line but I really have to gush about this pattern because it is AWESOME! Jennnayyy! Congrats on the release today!! Loove the sleeve tabby thing! Great news Jenny. Can you share a picture of the fabric requirements please? That way I can start assembling (buying) fabric in readiness for the pattern arriving. Hi Sandra – the full fabric requirements chart is available on the product listing here. Thanks Jenny. I don’t know how I missed that when I was looking first time round – perhaps I only looked at the bottom of the page. Thanks for replying. I’ve made plans for a shopping trip very soon (we live a long way from a decent fabric shop) and I will be ordering the pattern as soon as Sew Indie NZ announces they have arrived. Yahoo! I’ve been trying to find a TNT basic T-Shirt pattern for ages, I’ve tried a few but the number of alterations needed to get the fit I want have put me off… Clever you has created a curvy T-Shirt WITHOUT DARTS!!! If the Concord fits as easily and well as my Appletons I will be very happy indeed. How exciting! Will it be available from your UK stockists as well? I am so thrilled–my work uniform is slacks and a nice t-shirt (living in LA has its advantages). I have a bunch of t-shirting fabric, and have been hesitating because I couldn’t figure out how to do a FBA on a pattern without a dart. Thank you for reading my mind!! I cut out my first Concord yesterday and it’s looking quite good. I did find that the fit was rather skimpy/close fitting, so planning to rectify that next time round. Helped a friend to make a top from one of the Casherette dress patterns and that seemed a bit close fitting as well ( we used the body measurements to select size of course! I had noticed the t shirts on instagram and bet my friend that it would be next. I have also placed bets on what the next patterns will be! When will they be released? Glad to hear it’s working well! My knit patterns are designed with some negative ease through the bust, so they are slim fitting – certainly a lot more than big 4 patterns, if that’s what you’re used to. I’d recommend comparing the body measurements and finished garment measurements generally to get an amount of ease you’re comfortable with! JUST MADE THE CONCORD T-SHIRT AND I’M SO HAPPY WITH THE FIT; IT IS ALL I HAD HOPED FOR AND MORE, WITH ONE RESERVATION, THE NECK BAND IN BACK DOES NOT LAY FLAT BUT IS STANDING UP SO I MUST HAVE DONE SOMETHING INCORRECTLY, ANY ADVICE? I love this shirt pattern. It’s on my list to purchase. I do have a question, what jeans are those you’re wearing in the pattern photo that’s rolled up at the bottom? I love how they fit you!!! Did you make them?